The Piano Lesson is a 1990 play by American playwright August Wilson. It is the fourth play in Wilson's The Pittsburgh Cycle. Wilson began writing this play by playing with the various answers regarding the possibility of "acquir[ing] a sense of self-worth by denying one's past". 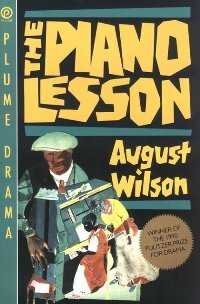 The Piano Lesson received the 1990 Pulitzer Prize for Drama. A Romare Bearden painting, The Piano Lesson, inspired Wilson to write a play featuring a strong female character to confront African-American history, paralleling Troy in earlier Fences. However, on finishing his play, Wilson found the ending to stray from the empowered female character as well as from the question regarding self-worth. WhatThe Piano Lesson finally seems to ask is: "What do you do with your legacy, and how do you best put it to use?" Set in 1936 Pittsburgh during the aftermath of the Great Depression, The Piano Lesson follows the lives of the Charles family in the Doaker Charles household and an heirloom, the family piano. The play focuses on the arguments between a brother and a sister who have different ideas on what to do with the piano. The brother, Boy Willie, is a sharecropper who wants to sell the piano to buy the land (Sutter's land) where his ancestors toiled as slaves. The sister, Berniece, remains emphatic about keeping the piano, which shows the carved faces of their great-grandfather's wife and son during the days of their enslavement.